The banker says the board is volatile. He says he wants Liam to sweat a bit as this offer would be enough to get married with. It looks like the Banker is going to offer the average cost of a wedding. Noel says the offer is the average cost of a UK wedding. Great offer without the button in play. I'd just about go on here. Liam says the next offer would be so dangerous. Noel gets Liam's partner to join him at the Pound Table and they discuss the offer. The banker talks to her and warns about the top two going and how Liam could go straight away with £16k. Sam asks when Liam will get this opportunity again. Noel says there was a joint desire to go on but a reality check of what the £16k means. It's looks like his GF cheated him out of honeymoon money. 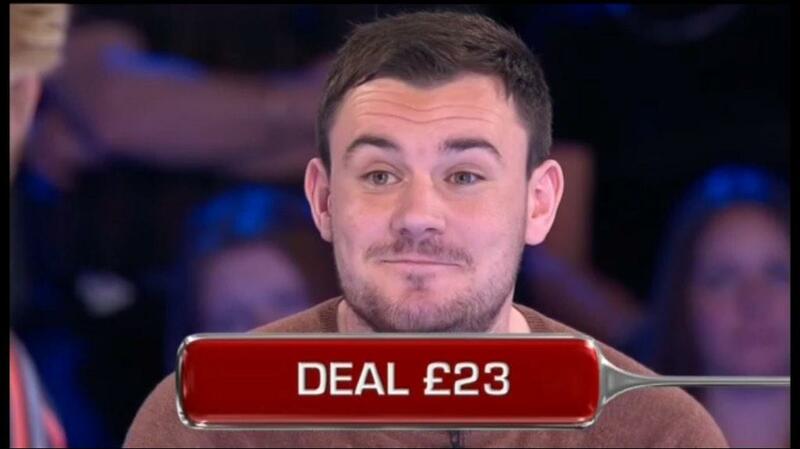 Laim would've certainly pressed the button at 7 box and dealt the likely offer of £20,000 there if he had it. Last edited by American Coupon Boy on Sat Nov 12, 2016 2:22 pm, edited 1 time in total. Noel says the difference between £16k and £18k was bearable. The swap is guaranteed as the £250k is in play. Noel swaps Liam's box 6 for box 21. Thankfully he swapped the box. Noel runs through the box 23 options. His winnings remain at £16,000.